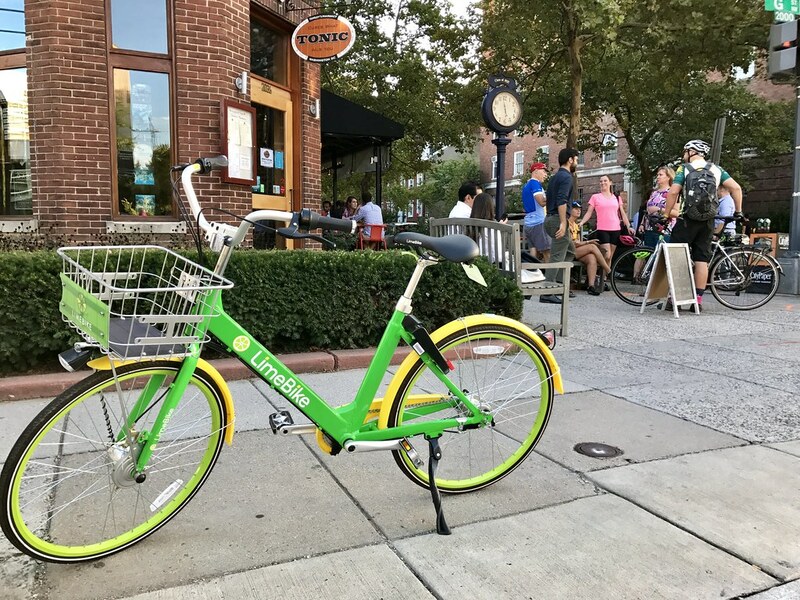 Dockless bikes, like this one from Lime, have become a familiar part of the Washington, DC streetscape. What’s remarkable about the rise of dockless bikesharing is how unremarkable it has become. An apocalypse was anticipated. Washington Post readers gleefully predicted failure, with the bikes stolen and destroyed (like in Baltimore) or begriming the streets in vast piles (as in China). But what if a revolution occurred and no one noticed it? The bikes, first green ones from Lime, and then a rainbow of other colors, appeared on the streets of DC, lined up and ready for use, part of a pilot program. Photos were snapped – by me, and others – entranced by the novelty of these seemingly unsecured bikes in a city where anything left outside gets stolen. The bikes then dispersed, taken by riders young and old (I saw kids in school uniforms on them) to surprising places in and out of the city. A couple were left by National Airport. Others made their way deep into the Maryland and Virginia suburbs, despite the fact that they were supposed to be kept in DC. Without the requirement to dock the bikes, people left them in alleys, Metro stations and on top of cars. Checking the Lime app to see where the bikes had gone became a popular activity on Twitter. I wondered about the cyclist near Seven Corners, navigating suburban highways on a small, rickety bike. For the bikes are subpar. Biking a couple miles on a Lime required an inordinate amount of work – the geometry is off. Ofo is better though its airless tires (a feature of all the dockless bikes) make the ride a rough one on the mottled streets of DC. You can’t be tall on any of these bikes, for the seat doesn’t go up high enough to accommodate long legs. There is one major exception to my dockless critique: JUMP. Dockless with a difference, JUMP is a pedal-assist electric bike. And it rocks! Get on this sizable steed, pedal a couple times and the electric motor kicks in, rocketing you down the street at a speed that’s actually a little scary. The more you pedal, the faster the ride gets, ferrying you to your destination without breaking a sweat. The advantage of dockless, whether it’s Lime, Mobike, ofo or JUMP, is that you can pick up and leave the bike anywhere you want. It works through an app on your phone. Check the map to find a bike, scan the code on the back of it and ride off. When you’re done, leave it and slide the rear-wheel lock into place (every bike should have one of these). More bikes than cars on 15th St during rush hour. DC needs more bikes. We have a great bikesharing service – Capital Bikeshare – but in many neighborhoods, the docks are empty by 8 AM. And while CaBi has saturated Northwest DC, there are many neighborhoods, particularly east of the Anacostia, where bikes are few and far between. Dockless offers the potential to change that, to address issues of equity that are present in any DC debate. Also, more bikes means safer cycling for everyone. The advent of Capital Bikeshare slowed down the crazed commuters that fill this city every morning, by making drivers aware of cyclists. They’re more cautious around me when I’m on a big red CaBi, than on my regular bike, because they assume I’m a lost tourist. 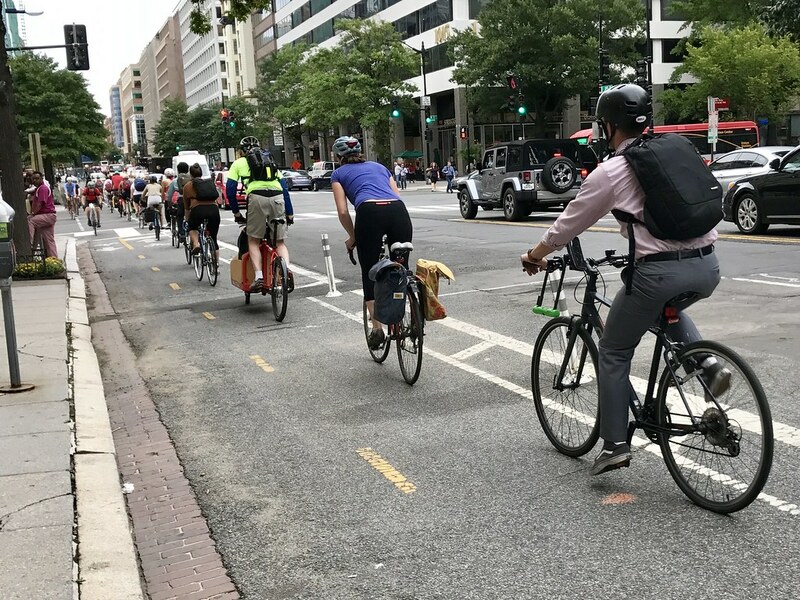 Adding more bikes might make MD Driver in DC hesitate before running that red light. Maybe. According to Wired, dockless bike sharing is the next Uber. There’s big money in cheap bikes, with the Chinese startup Mobike valued at $3 billion. That’s an astonishing valuation for $1 an hour bike rides. Investors believe that dockless bike sharing is a new kind of business that can operate on scale, offering a service that urbanites will eagerly adopt. Seems so easy. Create an app, flood a city with bikes and profit. For users, the experience is seamless – no humans required. Find a bike with your phone, scan it, and go. But if investors think that bike sharing is a new people-free business model, they are mistaken. An unseen army is busy at night fixing bikes, moving them around and retrieving lost ones. 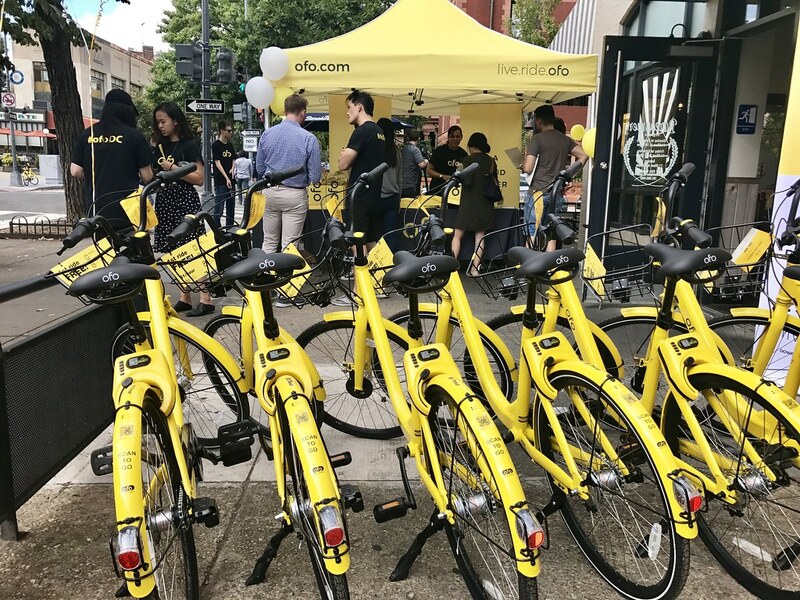 Ofo had a launch party recently near Dupont Circle with free lemonade and swag. Started by a Chinese college student, they’re the original dockless bikesharing service, with 400 bikes in DC now. An ofo rep said that someone rides every bike every day to make sure it works. Dockless also depends on the goodwill of a city and its residents, for the bikes occupy public space such as sidewalks. The ofo rep I talked to recognized that they had to be good corporate citizens. It’s a business, like much of the new economy, that uses the commons for corporate profit, with no requirement to benefit society, unless we demand it. While talking at the launch party, we saw JUMP and Spin bikes cruise down R Street. A couple biked by, one on a CaBi, the other on a Lime. A Mobike was parked on the sidewalk. The ofo reps offered free rides on their bikes to people coming up from the Metro. It seemed so unremarkable, as if these brightly colored bikes had always been with us. Critics claimed that it would never work. 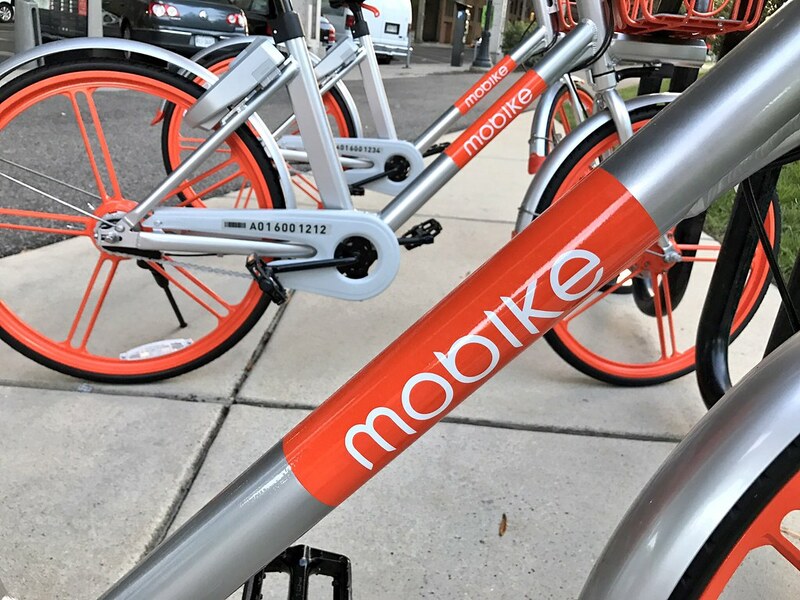 Yet, in just a few short days, dockless bike sharing has gone from novelty to just another part of the busy urban landscape, the city and its residents rapidly adapting to the latest advance in transportation. The scene of the injury. It felt like someone had hit me on the back of the leg with a baseball. 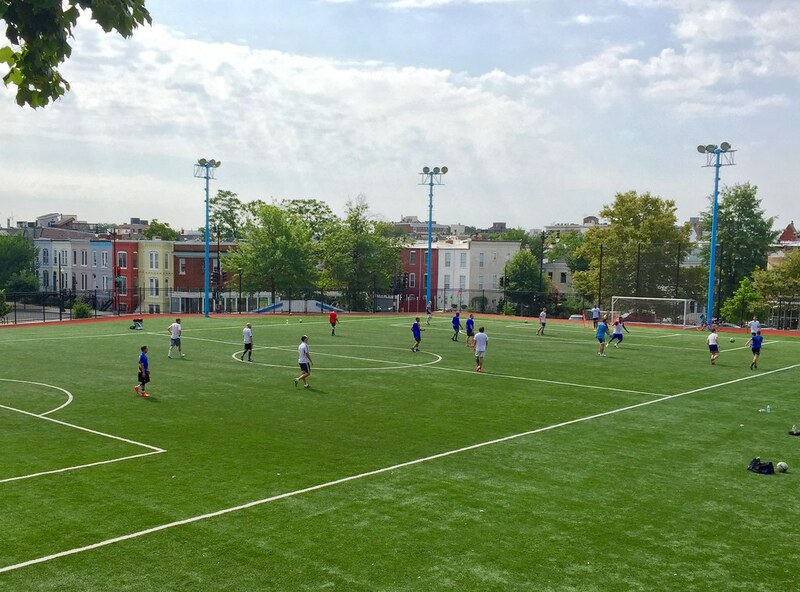 One moment running on the soccer pitch, the next yelling in pain. I turned around to see where the baseball was – but there was nothing on the ground. Instead, just players staring at me in puzzlement. My calf had exploded. That’s what it felt like. Limping off the field, I sat down and sipped water as friends came to check on me. “I don’t know, not so good, maybe need hospital,” Oleg the Russian said. Instead, I consulted Dr. Google. He diagnosed a torn calf muscle, with varying and frightening levels of severity. Sitting on the sideline, I read about muscles torn and bunched, swelling and other symptoms. Did I hear a popping sound? I don’t think I did, just a sharp, sudden and arresting pain. Nothing was bruised or red. The calf was tender and it hurt to walk. A friend asked if I wanted to go the emergency room. I did not. I had my bike. If I get on it, I could bike home. Gingerly, I hopped on, put my Specialized Sirrus into its lowest gears and slowly pedaled home, my bike both transport and a rolling crutch when I got to the lobby of my building. This is a recurring injury for me, though this was the most severe occurrence. Five years earlier, after similar pain, I went to an orthopedist. It was like a factory. Patients came in, they were diagnosed, sent for an MRI, given drugs and prescribed orthotics. No matter the kind of foot/calf pain, that’s what you got and a hefty bill was sent to Blue Cross. Having been through that, I knew that there was no real treatment other than staying off it until it got better. So, I did, keeping my leg up and on ice all afternoon. Transport and crutch, my Specialized Sirrus. The next day, I wanted to go out for coffee. I’m a terrible invalid. I could accept not being to able to walk but if I couldn’t bike? Unthinkable. I figured I could bike for coffee without walking more than a few steps. Using my bike again as a crutch, I made it to the elevator and out the front door of the building with just a little bit of pain. Then I hopped on the bike and rode to get coffee. Moving on two feet – painful. Moving on two wheels – painless. I’m a huge fan of The Obstacle is the Way. Great book. I recognized this scenario. If walking is taken away from me, then what opportunity am I given? The opportunity to bike everywhere! Let my feet never touch the ground, but only be on pedals, as I make my way around the city. So, it’s life on two wheels for me (not a problem! ), as I minimize walking and maximizing biking. Today, I tried grocery shopping by bike, buying just enough food to fill my backpack, choosing items high in calorie count but low in size. I’m fortunate to live in a city. If I was in the burbs, I would be trapped. In Washington, I can get everywhere I need to go by bike. Dockless means you can leave LimeBike in front of the local bar. This week has also seen the launch for four (!) 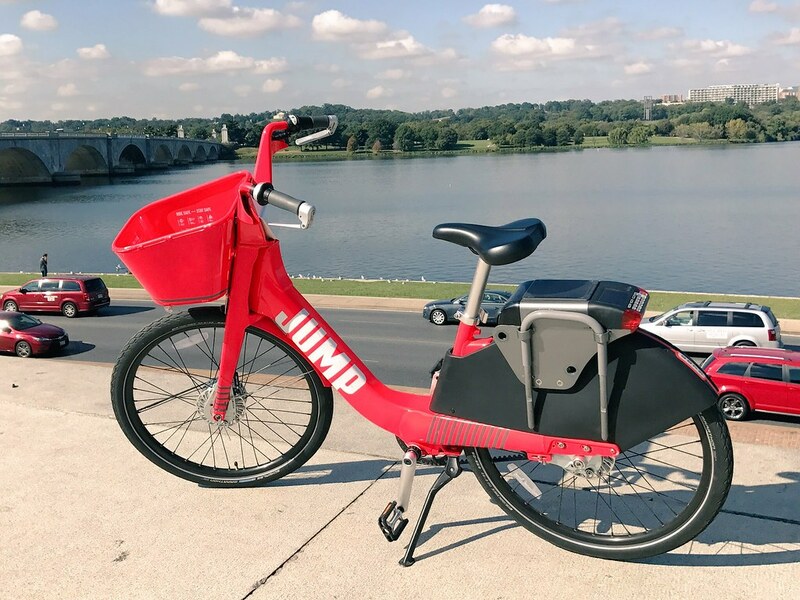 separate dockless bikesharing systems in DC. Dockless means you can leave the bikes anywhere you want. I tried one of them out – Lime. While the bike itself was unimpressive, the technology behind the service is interesting. You download an app, scan the barcode on the back of the bike, and the rear-wheel lock unlocks. When done, you just leave the bike wherever and snap the lock shut. It’s an experiment. 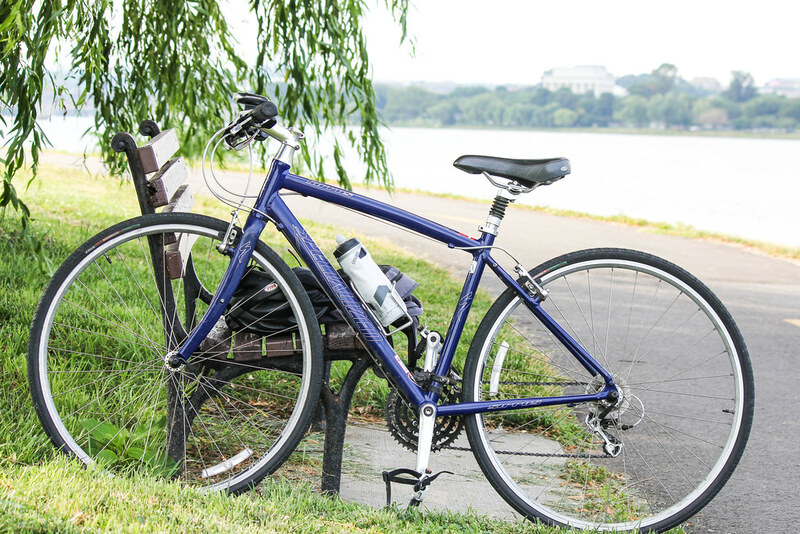 Will DC take to these new bikes or will they all end up in the river, like other cities? Time will tell. Time is also what I need. There’s no real treatment for a pulled calf. It just takes some time to heal. In the meantime, I’ll be on two wheels.